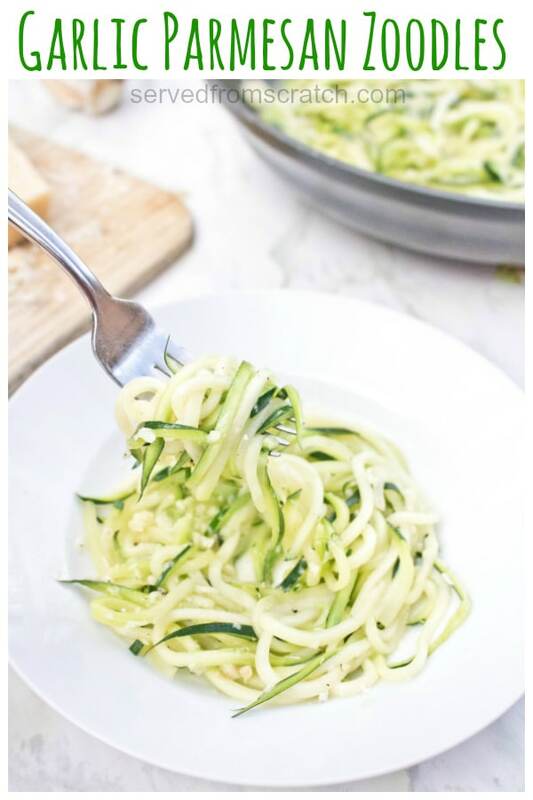 Swap out the pasta for fresh zucchini noodles and add garlic and Parmesan for Garlic Parmesan Zoodles, an easy and delicious side dish or light dinner that’s ready in less than 15 minutes! Zucchini season is here! Is anyone else pulling baseball bat sized zucchinis out of their gardens? We were a teeny tiny bit busy leading up to this summer (read: baby #2), so our garden is a little bit smaller this year. 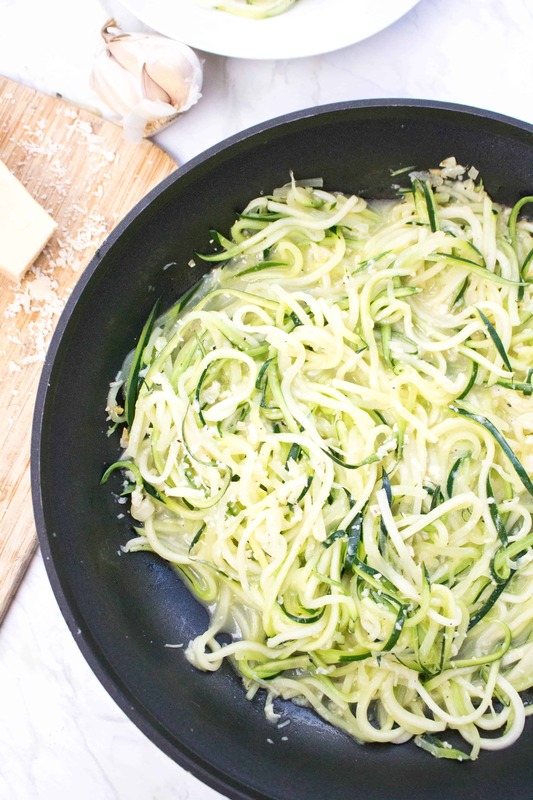 But we still have a ton of gorgeous zucchinis that we’re making some Sweet Zucchini Relish with and now also one of my new favorite zucchini dishes, these Garlic Parmesan Zoodles! 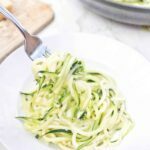 So last year I made the incredibly embarrassing discovery that all the time I’d spent pining over a spiralizer so I could “zoodle” zucchinis was wasted because the mandoline in our cupboard could do it! 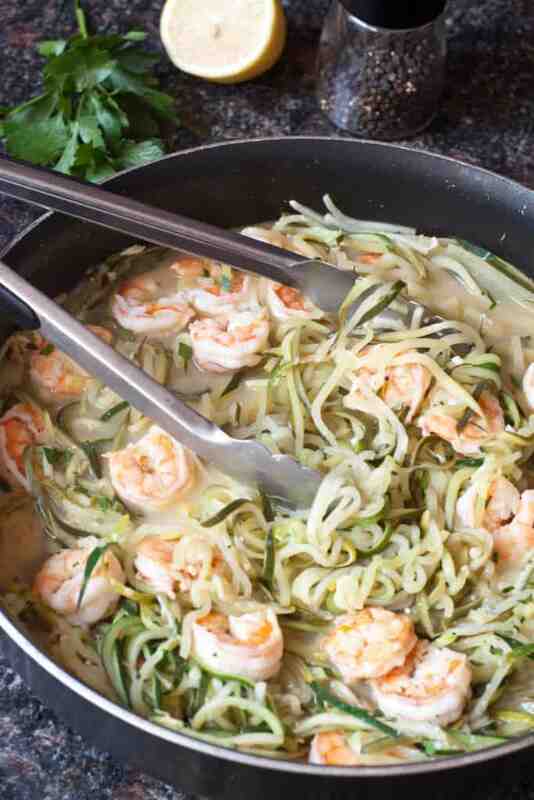 Its result was the delicious Shrimp Zoodle Scampi and I vowed to make up for lost time the next year, so this zucchini summer season I was anxious to not waste any zoodling time! In case you’re new here, garlic is kinnnddd of a major staple in this house. Like it’s its own food group, staple. Between our Garlic Chicken Piccata, Garlic Kale, Butter Garlic Mushrooms, Parmesan Garlic Baked Chicken Wings, and especially our 15 Minute Garlic Fried Noodles, we loooovveee garlic. 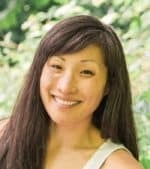 Like we love garlic in the way that neither my husband or I would be married to each other if we didn’t share a deep deep love for all things garlic. M loved it. Especially since I told her they were “zoodle noodles” and anything noodles are life in her little two year old world. Girl is my daughter, after all. 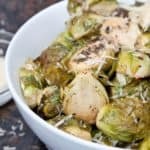 This dish is so fast, so easy, and healthy! 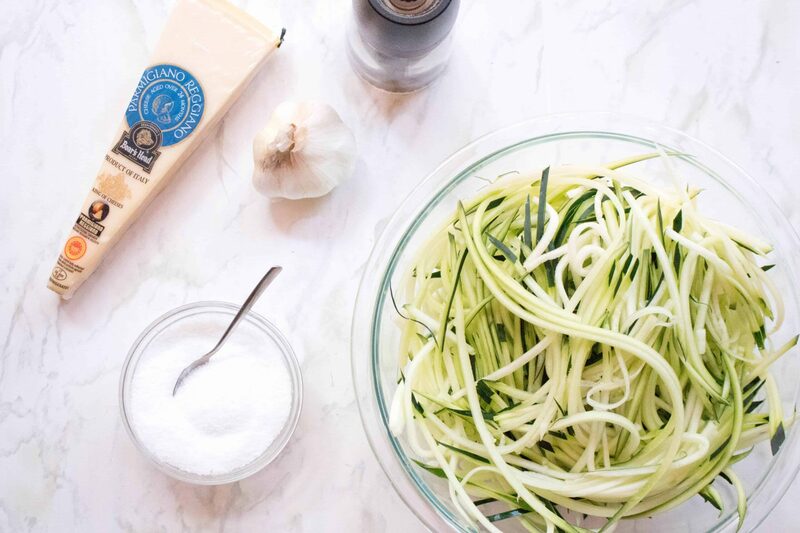 A side dish or a main meal, these Garlic Parmesan Zoodles are our new favorite way to turn those garden zucchinis into something delicious. Plus, since we just became a family of 4 (plus one fur baby), time is not in abundance. True story, I made this dish while at home, by myself with a two year old and a three week old. The two year old was in possession of paints and multiple paint brushes and the three week old drinks milk like college freshman during rush week. 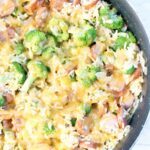 SO, if this mama can make this dish in those conditions, you’ve got to know it’s quick and easy. 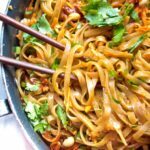 So take those baseball zucchinis and your mandoline (or fancy schmacy spiralizer) and make this! 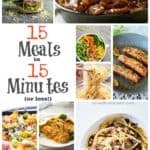 But be sure to share it with me and how much you love it on Facebook, Instagram, or Pinterest! 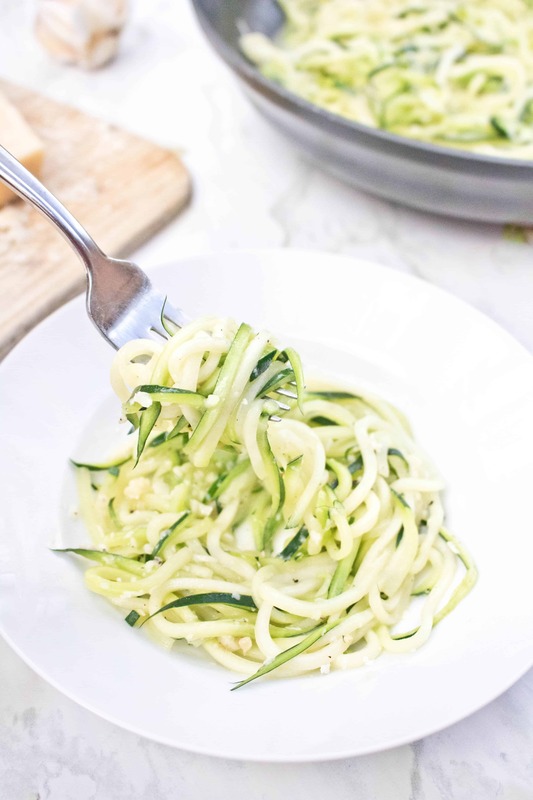 Swap out the pasta for fresh zucchini noodles and add garlic and Parmesan for Garlic Parmesan Zoodles, an easy and delicious side dish or light dinner that's ready in less than 15 minutes! In a large saute pan, heat olive oil over medium heat and add garlic. Saute for 1-2 minutes, careful to not burn. Add zoodles, salt and pepper and saute for 3-5 minutes until zoodles are soft. Add Parmesan cheese and mix well. 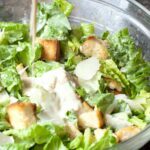 Serve immediately and top with more Parmesan cheese if desired. 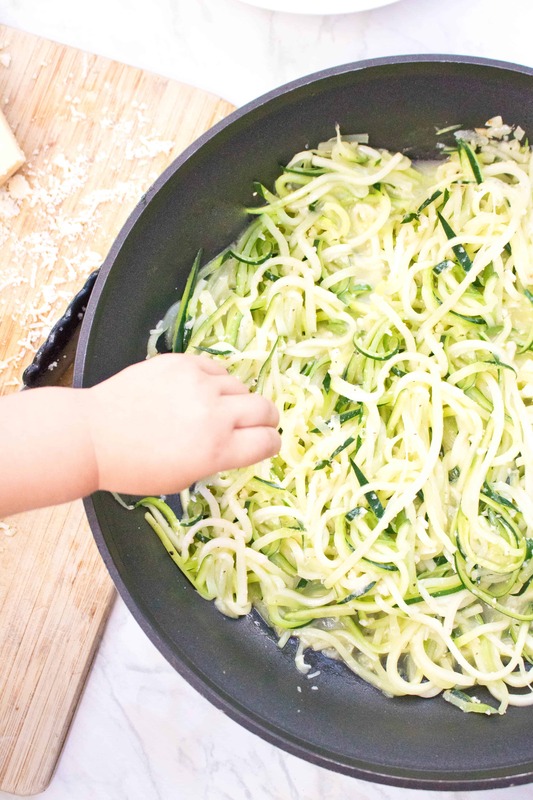 I knew people who cook zoodles but really haven’t tried zucchini noodles. 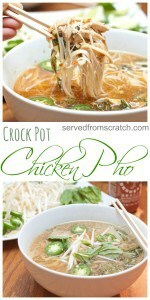 I must give this one a try. It looks so good and absolutely healthy. I do like the combination of garlic and parmesan too. Oh you have to try them! They’re such a delicious healthy alternative!